While there are dozens of dogwood species, I’ve selected the four I feel are the most valuable to the home landscape. Three are trees including Flowering Dogwood, Kousa Dogwood, and Pagoda Dogwood. The fourth is a shrub called Red Twig Dogwood. 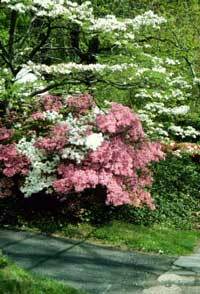 Probably of the four, the Flowering Dogwood is the favorite. This dogwood, with its masses of early spring bracts, its dark red autumn foliage, and its bright red berries, is probably our most showy native tree, although the Pagoda gives it a run for its money.